Citizant’s comprehensive PMO support services help our Government clients meet mission-critical requirements in the most efficient and cost-effective manner possible. Whether working with a PMO or a project manager’s team, Citizant’s program management professionals ensure each project meets its stated requirements while adhering to schedule and budget. 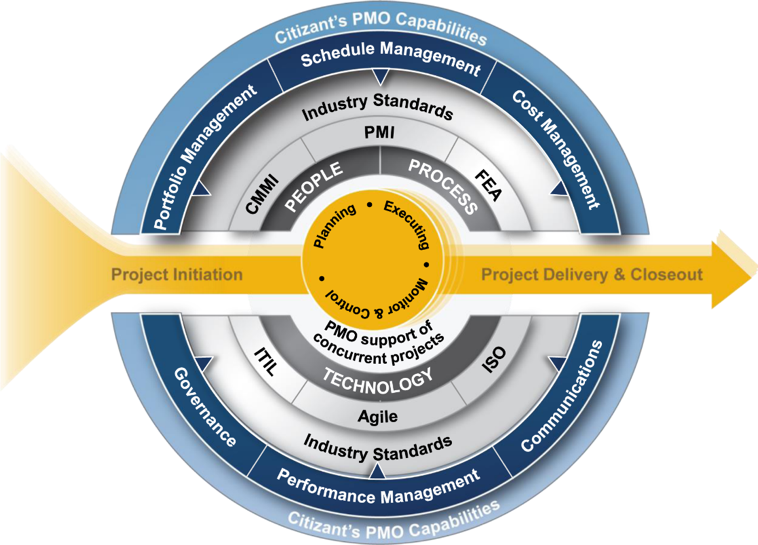 Citizant’s Performance Assurance Methodology (PAM) integrates quality best practices with project management maturity to enable successful deliver of multiple, concurrent projects in a PMO setting. We employ a structured approach based on management best practices from CMMI-DEV and CMMI-SVC Maturity Level 3 and ISO 9001:2015. Citizant is a registered CMMI Institute Partner, recognizing our expertise and ability to deliver CMMI best practices, planning, and leadership. Our program management solutions are not only on target, but also lead to predictable, repeatable success – earning us an average of 4.8/5.0 on CPAR scores across all rated 2016 and 2017 task orders and programs. Our staff of proven program management professionals includes many Project Management Professionals (PMP®) certified by the Project Management Institute (PMI), who employ PMI’s Project Management Body of Knowledge (PMBOK®). More than 75% of Citizant’s IT professionals hold certifications in relevant technical disciplines such as ITIL, Agile, DevOps, cyber security, IT service management, network engineering, or Federal EA.